General Staff Chief Nikolay Makarov gave the main report at the 17 December session with Duma Defense Committee members. Makarov talked about the military’s ‘new profile’ reorganization to include a reduction to three levels of command. 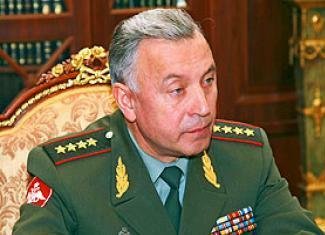 He talked about major exercises in 2009 and plans for the Vostok-2010 exercise to begin in late June. Committee Chairman Viktor Zavarzin billed the topic as “The Course and Interim Results of the Realization of RF President Dmitriy Medvedev’s Decision on the Formation of a New Profile of the RF Armed Forces.” Deputy defense ministers Nikolay Pankov and Vladimir Popovkin also reported. According to Gazeta, the session went 3 hours. Committee members were unhappy because they either didn’t get an answer to their questions, or didn’t even get to pose a question. There were not more than 15 questions. The lengthy reports and long, drawn out answers used most of the time. Pankov talked about officer and warrant officer cuts, but said nothing new. Popovkin gave a secret report on arms acquisition for 2010. He apparently indicated there aren’t, and won’t be, any alternatives to the troubled Bulava SLBM. Deputy Committee Chairman Mikhail Babich managed to propose sharing Defense Minister Serdyukov’s Order No. 400 premium pay equally among officers of good units, rather than giving it to a few. Someone also proposed postponing the elimination of warrant officers until the first professional sergeants appear in the ranks. Sovetskaya Rossiya reported that Serdyukov didn’t have much to say and showed some irritation. Makarov maintains everything’s great, but mid-ranking servicemen say otherwise; life is not like the Defense Ministry paints it. The official answers to questions were unconvincing, and former Black Sea Fleet Commander Komoyedov says the speakers didn’t assess Russia’s combat capabilities. For his part, he sees major problems in training personnel and rearmament. Komoyedov concludes military men are becoming cringing and servile because they fear being put out of the Armed Forces. N. V. Kolomeytsev wanted to know how exactly how many officers remain and how many have been put out. Apparently, Pankov must have said only 59,000 were put out this year. Kolomeytsev says the session was closed to keep information from getting out, but also to conceal that the Defense Ministry reforms are being introduced by incompetents. This entry was posted in Command and Control, Force Modernization, Serdyukov's Reforms. Bookmark the permalink.